Although it’s a relatively obscure entity with no paid staff, Blaine Stum, its former chair who is stepping down to attend graduate school in Washington D.C., has used the position to spar with law enforcement over police militarization, criticize the city’s “criminalization of homelessness” and called attention to an attack on a transgender homeless woman. 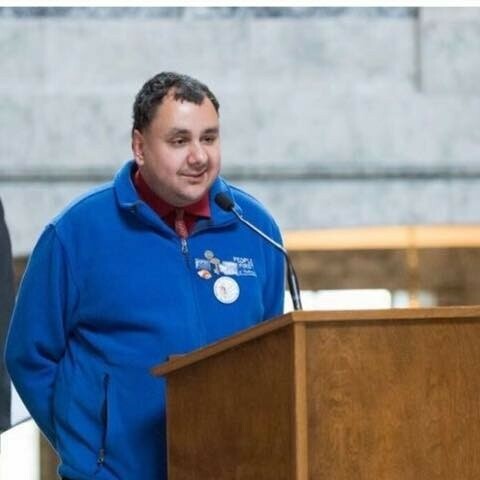 Lemus — community relations facilitator at Skils'kin, a nonprofit that provides support services to developmentally disabled individuals — says his father helped found the HRC while working as a city staffer in the 1990s, and serving on it has been something he’s wanted to do for a while. Lemus says he’ll be the first HRC chair with a developmental disability (he says he’s likely on the autism spectrum). Inlander: What is the upcoming work for the commission? John Lemus: A lot of what we are going to continue to do is monitor criminal justice reform. We’ve been keeping a really close eye on that. We’re really excited about the MacArthur grant and we are coming up with programming for individuals in the jail so they can move forward when they get out. What are you doing with sick and safe leave? We are continuing to make sure that it’s being followed through. Now that it’s passed we will continue to advocate that that moves forward. The commission has no enforcement arm, so a lot of what we can do is work with citizens that are supposed to receive the benefits after the ordinance was passed. And we will continue to keep our eyes on things and attend any meeting with the business community because they will be a large part of making sure this happens as well. It’s something I'm really proud that the commission could support. What do you see as the role of the HRC? What I see as its role is to make sure that we are constantly advancing rights for the citizens and that we speak up and continue to be that catalyst for change. Anything you want to focus on? We’ve seen a lot of religious intolerance in the last six months, and it's just unacceptable and Spokane is just not that kind of a city. We need to work on that issue a little bit more so people understand each other and are at a bit more and more accepting. The HRC has no staff. Is that a barrier to how much you can do? I’m going to answer this one carefully [laughs]. The council has been really supportive of the commission in the past, so they will help. I know for many years the commission has not had any allocation from the administration in regards to its work. That’s something I want to work with the mayor and others to fix that so we have more resources. Right now all of our commission members have been doing amazing work. Courageous Conversations is an example of that what community rallied around. But we could do more work if we had more resources. How will you be different than Blaine Stum, if at all? I think that this will be the first time the commission or any city commission has had a chair that has a developmental disability and I feel I can bring some insight into what people with developmental disabilities can do. There's a lot of stigma out there, and one of the things I’m excited to do is show people that even though I have a disability, I’m more than capable of going out there and getting the work of the commission done. One of the things that I think that might be really challenging is that Blaine was in City Hall day in and day out. But I’ve got fairly good connections in City Hall.